This paper presents a large collection of new weak-key classes for the IDEA cipher. 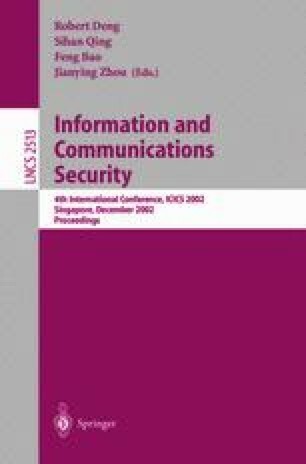 The classes presented in this paper contain 253-264 weak keys (as compared with 251 differential weak keys presented by Daemen at CRYPTO’93 and 263 differential-linear weak-keys presented by Hawkes at EUROCRYPT’98). The novelty of our approach is in the use of boomerang distinguishers for the weak-key class membership test. We also show large weak-key classes for reduced-round versions of IDEA. The work described in this paper has been supported in part by the Commission of the European Communities through the IST Programme under Contract IST-1999-12324 and in part by the Concerted Research Action (GOA) project Mefisto 2000/06 of the Flemish Government. Sponsored in part by the Concerted Research Action (GOA) project Mefisto 2000/06 of the Flemish Government. NESSIE Project-New European Schemes for Signatures, Integrity and Encryption-available at http://cryptonessie.org.